McCain Foods honored its Top 10 Potato Growers at the annual McCain Grower Barbecue at the Presque Isle Inn and Convention Center in Presque Isle on Aug. 24. 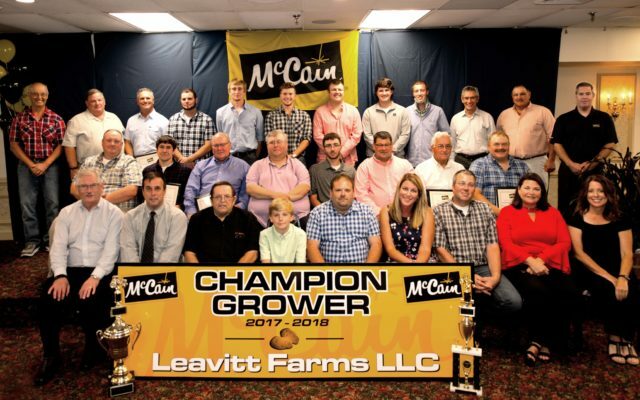 PRESQUE ISLE, Maine — McCain Foods honored its Top 10 Potato Growers at the annual McCain Grower Barbecue at the Presque Isle Inn and Convention Center in Presque Isle on Aug. 24. Almost 300 guests gathered to celebrate the 2017 growing season and recognize the growers and their achievements. Champion grower selection is based on the highest standing quality of the following three delivery categories: field direct delivery, winter storage delivery and refrigerated storage. 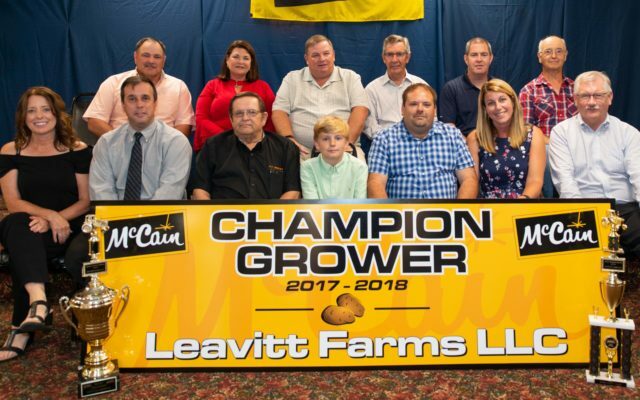 Leavitt Farms, LLC of Limestone placed first in field direct category and second in the refrigerated storage category to receive the position of Champion Grower. Randy Leavitt, owner of Leavitt Farms, said it was a great honor to receive the Champion Grower award. “It’s something we have always strived for and it was an honor to receive it this year with my Dad and my oldest son present. I credit the farms’ success to my hard working and dedicated crew and the knowledge passed down to me from my Dad. Allison McCain, Chairman of McCain Foods Limited, extended personal congratulations to the Leavitt family and all of the McCain growers. McCain expressed to the group the importance of their partnership and the value he places on the relationship and their business. Other McCain management on hand to congratulate the growers included Christine Wentworth, vice president of Agriculture North America; David Good, director of agriculture; Rodney Norquay, senior director of manufacturing; Dale McCarthy, vice president of integrated supply chain; Dave Giroux, Easton plant manager; and Bart Bradbury, field department manager. Other special guests included Walter Whitcomb, Maine commissioner of Agriculture, Conservation and Forestry; and Dave Lavway, director of the USDA Farm Service Agency. In the category of field direct delivery, G.R. Parent of Hamlin claimed the top spot. Second place in this category went to Brent and Reginald Edgecomb of Limestone, and third place went to Clayton Roy Farms (Clayton Roy and Robert, Brett, and Taylor Butler) of Caswell. In the winter storage delivery category first place was awarded to Labrie Farms LLC of St. Agatha (Dan, Keith, Duane, and Jacob Labrie). Second place in this category went to Wright Farms of Littleton (Dana and Jonathan Wright). Third place was awarded to Kyle Blackstone and Sons of Caribou (Kyle, Ben, and Breen Blackstone). In the refrigerated storage category, first place went to Kingsbury Family Farm of Bridgewater (Shane and Keith Kingsbury). Second place in this category was awarded to Guerrette Farms Corp. of Caribou (Ryan, Brian, and Andy Guerrette). Third place went to Snow Road Farms of Bridgewater (Derek Kilcollins and Wayne Bradbury).